Typical stuff. Man that's accustomed to getting what he wants and goes after the weak-willed female. Seriously, she annoyed me. And her jackass of a friend was a really really convenient plot device. The lady protested a bit too much for my liking so this wasn't one of the more enjoyable "cheap romances" for me. Yeah the whole story wasn't just anything I could connect to. There was a lot of drama and I don't think the novel really went anywhere. It just stayed mediocre for me. I wanted to like this book, but I couldn't get past the incessant head hopping. The point of view changed from paragraph to paragraph. It was so annoying I couldn't finish reading it. And I was so excited to find a Presents book set in the United States. The extreme use of adverbs was another killer. Every paragraph was riddled with them. Never mind the fact that this author strings together two and three of them together in a row. That combined with the head hopping became too much to bear. I'm hesitant to purchase anymore of this author's books. I don't know how this made it past an editor. These are rookie mistakes. I'm sorry, but this story was poorly written. 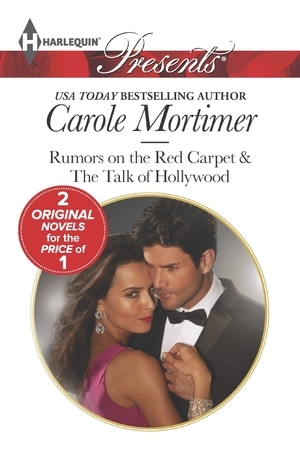 Harlequins are what they are and Carole Mortimer is still one of my favorite authors, that said-- a lot of HR and her books have the same formula and story and she has gotten a little racier then what I remembered these are still my quick, guilty pleasure reads. Lectura ligera, la autora se enredó en su propio culebrón, personajes sin una personalidad fija, muy parecido a las sombras de Grey, chica indefensa tipo millonario, no es lo mejor ni lo peor que he leído o llegaré a leer. Review based on the 1st bookI totally agreed with the review Sandy Milan made almost verbatim. Loved the 1st story 5 stars for me really, hated and could not finish the 2nd.